Stephen Figurative Chrisomalis. Has a nice ring to it, don’t you think? That spike peaking right around 1920 is really interesting; equally interesting is that thereafter, it drops back down to relatively modest levels until the 1960s, and then takes off again, reaching its historical peak in the late 1980s and keeping right on going. Now, it’s clear that the initial rise starts well before World War I, so this isn’t something directly associated with soldiers’ slang or the general mixing of dialects during and after the war, but looking at the Google Books results around 1920, this really seems to have been a fad at the time – most of the uses of “is [pronoun] middle name” are non-literal. But by the time that Agatha Christie wrote, in The Murder of Roger Ackroyd (1926: 144), “‘Modesty is certainly not his middle name.’ ‘I wish you wouldn’t be so horribly American, James.’”, the fad was already on the wane – although it never disappeared entirely, for the next several decades it was quite rare. I was a little surprised to see that there was no immediate bump related to the country anthem Sixteen Tons, first recorded in 1946, and whose rendition by Tennessee Ernie Ford in 1955 reached #1 on the Billboard charts for six weeks, but its line, “Fightin’ and trouble are my middle name” is in a middle verse and perhaps had little linguistic effect (although it was re-recorded many times throughout the 60s and beyond). The post-1965 bump could equally have been inspired by Bobby Vinton’s 1963 single, “Trouble is My Middle Name“, although it peaked only at #33, and, if I may say so, is not really very good. Regardless of the specific impetus, once it took off, it became strongly idiomatic, and today the phrase has become so well-known that it is covered in TV Tropes and elsewhere. I’m confident that my readers will regale me with their favourite examples. 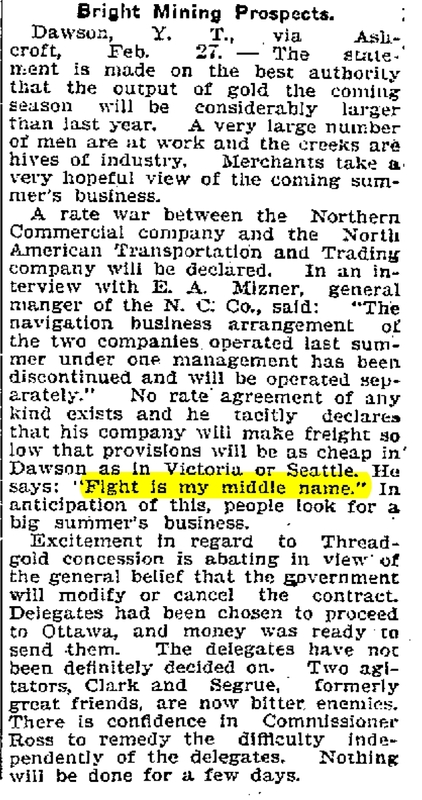 Worth noting that E. A. Mizner was Edgar, one of the brothers of the better known Wilson and Addison Mizner, scam artists who got their start in the Klondike. Wilson achieved success as a playwright, Addison as an architect and developer in Florida. Edgar apparently never recovered from gambling losses in Yukon. Wikipedia lists ten famous quotes by Wilson (e.g. “Stealing from one is plagiarism, stealing from many is research”). Can we at least credit Edgar with “… is my middle name”? Dan – fascinating stuff! I didn’t know the history. I do think that provisionally, we can credit Edgar with the coinage, although of course it’s entirely probable that one could find earlier ones. It does have a whole rough-and-tumble Klondike boastfulness about it.